Enter the Braun Derby, a German twist on the classic Brown Derby. 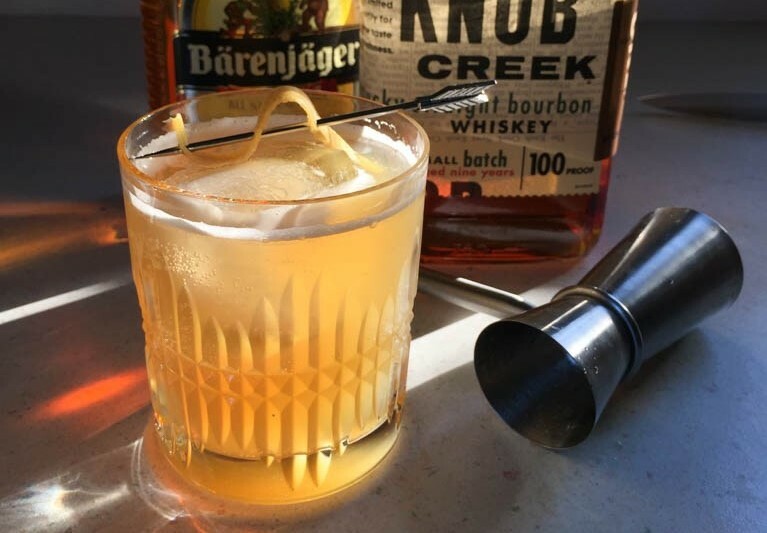 Created by our friends over at Bärenjäger Honey Liqueur, the recipe combines their liqueur with bourbon and a grapefruit radler for a sip that has that perfect mix of bold, tangy, and sweet. The bourbon brings the kind of potency you want in a cocktail while the honey brings to mind the season’s blooming flowers. Top it all off with a bit of the fruity, fizzy beer and you’ve got a drink that’s just as refreshing as the beginning of spring. If you want to make this cocktail even more appropriate for March, you can channel St. Patrick’s Day and swap the bourbon for Irish whiskey. For non-dark liquor drinkers, the sip could also be equally enjoyable with vodka. The recipe is undoubtedly strong, but hey, that’s never been a problem for us. If you choose, you can lighten things up by replacing the radler with ginger beer for an extra kick without the extra booze. In a cocktail shaker with ice, stir together the bourbon and honey liqueur until cold. Strain into an old fashioned glass with fresh ice. Fill the glass until full with the radler and garnish with a grapefruit twist.